This game is a great ice-breaking game for Bridal Shower Party and a great way of introducing guests to each other. I have made game cards for this game in three different colors and you can easily print this game in color of your choice using a home printer. This game is specially good for a small gathering with a few guests but you can also play it at big parties. How to Play 1: Distribute the game cards among your guests along with a pen or pencil and ask them to write three statements about themselves, two should be true and one should be a lie. When all the guests have finished writing each of them will stand up and read those statements one by one and rest of the guests will raise hands if they consider it a lie. Then the guest who is reading the statements will share the one that is lie. So all the guests who have guessed it correctly should give themselves 1 point at a page. In the end the guests with most points will be the winner. How to Play 2: It will be played in the same way as mentioned above but the guests will have to write three things they know about the bride and two should be true and one lie and guests will have to guess which one is a lie. At the end the person with most points will be the winner. 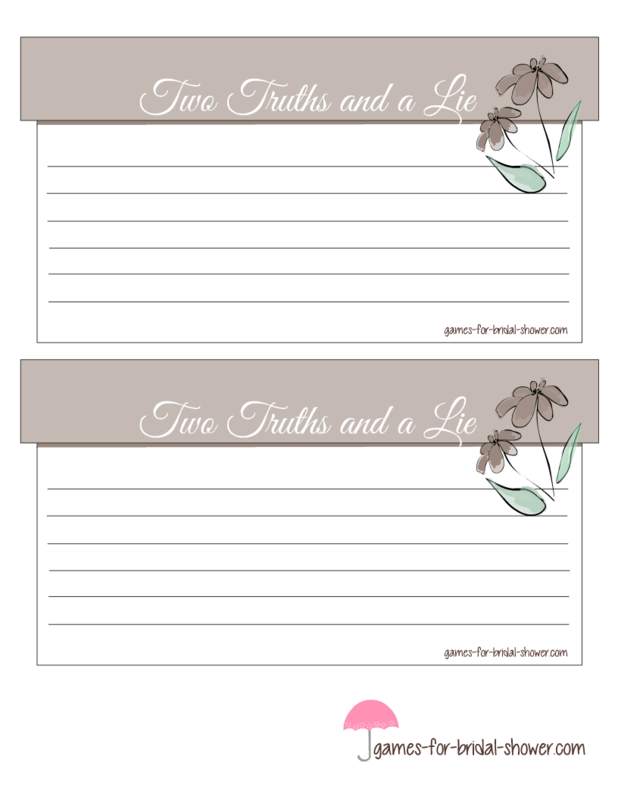 Click on the image shared above and right click and save the Two truths and a Lie game cards in pink color. On each printable of this game there are two game cards that you can cut around the edges using a paper cutter or scissors. 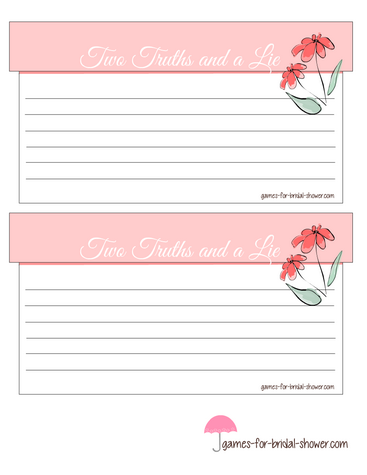 You should print game cards according to the number of your bridal shower party guests. 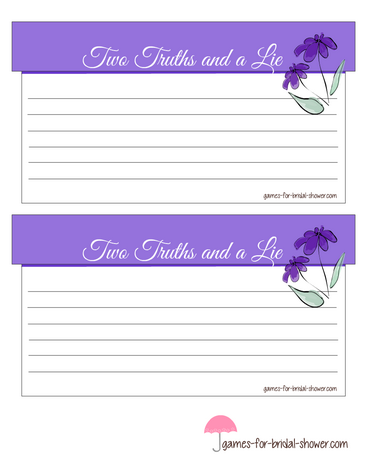 Here are free printable cards for this game in Lilac color. 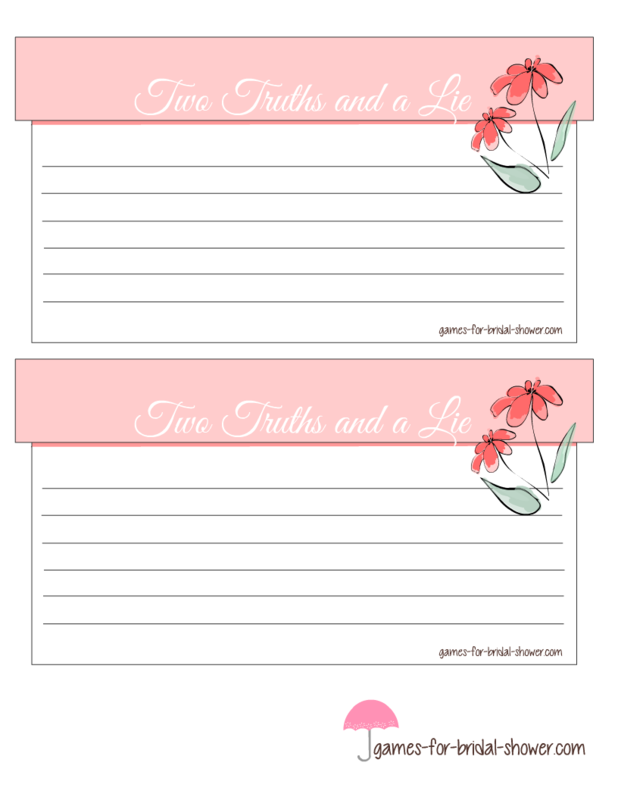 You can save the bigger image and print these cards if these match your bridal shower party theme more. You can play these in any of the two 'how to play' ways mentioned in the beginning of this page. Here are free printable game cards in light brown color. These are decorated with beautiful images of a heart and butterflies. You can click on the image shared above and then right click and save the larger image if that suits your party theme more.